Multiple choice as well as free response practice questions on electrostatics (with solution) were posted on this blog on many occasions. You can access them either by clicking on the label ‘electrostatics’ below this post or by trying a search for ‘electrostatics’, making use of the search box on this page. In both cases you would need to click on the ‘older posts’ and ‘newer posts’ buttons to access all posts. Today we will discuss a few more multiple choice practice questions in this section. (1) In a region of the atmosphere near the earth’s surface there exists an electric field of intensity 100 Vm–1directed vertically downwards. 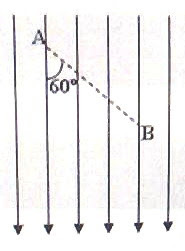 Consider a line segment of length 4 m inclined at 60º with the vertical (fig.). What is the potential difference between the points A and B? Since the electric field is 100 Vm–1and is directed vertically, a difference in height of 1 m corresponds to a potential difference of 100 V. The difference in height between the points A and B is AB cos60º = 4×½ = 2 m.
Therefore, the potential difference between points A and B is 200 V.
The electric fields due to the positive charge at A and the negative charge at B are directed from A to B and they will get added at the mid point of the line AB. The magnitudes of these fields are equal and is 200 NC–1 each, since the field is quadrupled when the distance is halved (in accordance with the inverse square law). The resultant electric field at the mid point of the line AB is 400 NC–1. The electric potential at the mid point of the line AB is zero since the positive potential produced by the positive charge is canceled by the equal negative potential produced by the negative charge [Option (b)]. The potentials of A and B are the same. Hence no charge will flow through the wire. [Note that the potentials of A and B are (1/4πε0)(Q/R) and (1/4πε0)(3Q/3R), which are equal]. The diagonal of the square has length 2 m and the distance of the centre from the corners is 1 m. The positive charges of total value 7μC will produce (at the centre) a total positive potential of (1/4πε0) (7×10–6 /1) volt = (9×109) (7×10–6) volt = 6.3×104 volt. [Note that the potential due to a point charge Q at distance r is (1/4πε0)(Q/r)]. The negative charge of value –3μC will produce (at the centre) a negative potential of (1/4πε0) (–3×10–6 /1) volt = (9×109) (–3×10–6) volt = –2.7×104 volt. Therefore, the electric potential at the centre of the square is (6.3×104 –2.7×104) volt = 3.6×104 volt. The correct option is (e) since the work done in moving a charge along the equipotential surface is zero. [Since the surface is equipotential, you don’t require a force to move the charge along the surface]. (6) Two identical thin rings A and B of radius R are arranged coaxially with a separation R between their centres. Ring A carries positive charge 2Q where as ring B carries positive charge Q. What is the external work requied to move a positive charge q from the centre of A to the centre of B? [The first term is due to the charge on A while the second term is due to the charge on B]. [The first term is due to the charge on B while the second term is due to the charge on A]. – V = (1/4πε0)[Q/(√2 R) – Q/R], as given in option (c). (7) A total charge (positive) of 1.11×10–9 C is sprayed non uniformly on a non conducting ring of radius 1 m. If E represents the electric field at any point in space due to this charge distribution and r = 0 represents the centre of the ring, what is the value (in joule per coulomb) of the line integral ∫– E.dr from r = ∞ to r = 0? The quantity given by the line integral from infinity to the centre of the ring is the work done in bringing unit positive charge from infinity to the centre of the ring. 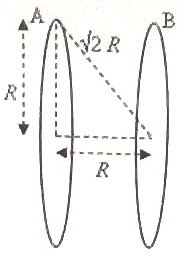 This is the electric potential at the centre of the ring and is equal to (1/4πε0)(Q/R) where Q is the total charge on the ring and R is the radius of the ring. Since 1/4πε0 = 9×109 Nm2C–2 (very nearly), we obtain the answer as 9×109×1.11×10–9/1 = 10, very nearly. Well, you will find a very useful post in this section here.